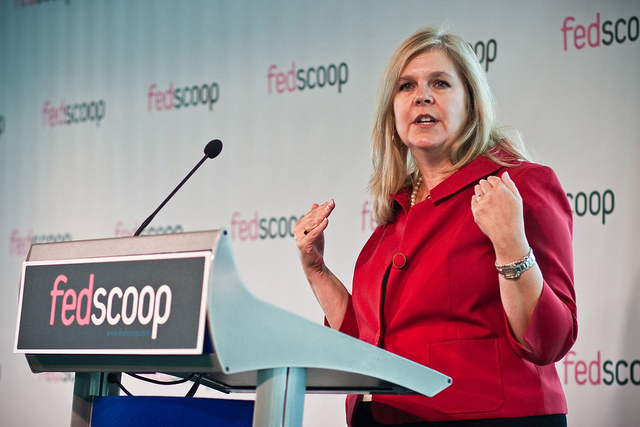 Gwynne Kostin will lead the new Digital Services Innovation Center outlined Wednesday in the White House’s federal government digital strategy, the General Services Administration confirmed to FedScoop. Kostin is currently Director of Mobile in GSA’s Office of Citizen Services and Innovative Technologies. The Digital Services Innovation Center will collaborate with a Digital Services Advisory Group comprised of members of the Federal CIO Council, Federal Web Managers Council and federal agency leaders. Gwynne Kostin is Director, Mobile in the Office of Citizen Services & Innovative Technologies at the U.S. General Services Administration. She is working with federal agencies to clear a citizen-centric path for mobile access to government. Gwynne previously was director of GSA’s Center for New Media and Citizen Engagement, where she worked to make it easier for government to engage with citizens and citizens to engage with government through the development of cross agency tools, policies and services. There she launched the government’s free, policy-compliant “build-a-blog” platform apps.gov NOW and the contest platform challenge.gov. As Director of New Media for the U.S. Department of Homeland Security, she drove the use of new technologies to solve business problems creating the department’s first social media strategy, developing a cross-agency web communications model for disaster response, and leading new media communications and strategy for the department’s 22 agencies. Prior to joining public service, she spent ten years in new technologies, including founding a successful Internet start–up in an association and leading strategic Web communications in health care and education. She enjoys talking to interesting people and figuring out how things work.